Apple Tarte Tatin: The apple tarte tatin is an upside-down pastry in which the fruit are caramelized in butter and sugar before the tart is baked. 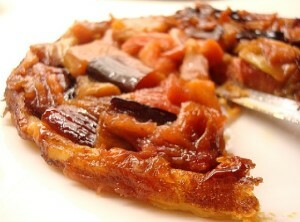 For Apple tarte tatin, the fruit being used is the apple. The light golden puff pastry, soft juicy apple and crisp caramel is a great combination. You could serve apple tarte tatin with a spoonful of whipped cream cold ice cream. Dust a clean surface and a rolling pin with flour and roll out the puff pastry until it’s just over 0.5cm thick. This will be enough to cover the ovenproof frying pan you’ll be cooking the apple tarte tatin in, leaving about 5cm extra around the edge. Peel the apples, then halve them horizontally and use a teaspoon to get rid of the seeds and core. Put the ovenproof pan on a medium heat and add the sugar, vanilla seeds and pod. Let the sugar dissolve and cook until the mixture forms a light caramel. Note: Please remember never ever to touch or taste hot caramel, as it can burn really badly. Once the caramel looks and smells delicious – it should be a lovely chestnut brown – add your halved apples. Carefully stir everything in the pan and cook for about 5 minutes or until the apples start to soften and you get a toffee apple vibe happening. Add the cubed butter and then lay the rolled pastry over the top. Quickly and carefully tuck the pastry down right into the edges – it’s best to use a wooden spoon so you don’t touch the caramel. Bake the apple tarte tatin for about 25 to 30 minutes, or until golden, with crispy caramelly pieces bubbling up from under the edges. To make it look like a tarte tatin you need to turn it out, which isn’t hard – but you do need to be careful with that hot caramel. So get a board larger than your pan and put an oven glove on to protect the arm holding the board. Put the board or plate on top of the pan and then quickly, carefully and confidently turn it out. Put it to one side for a few minutes, so the caramel can cool down. Apple tarte tatin is ready to be served. Divide the apple tarte tatin and serve with a spoonful of vanilla ice cream. If you have any queries regarding the Apple Tarte Tatin recipe, please leave a comment.